Cardbomb: New Stamp Sets! 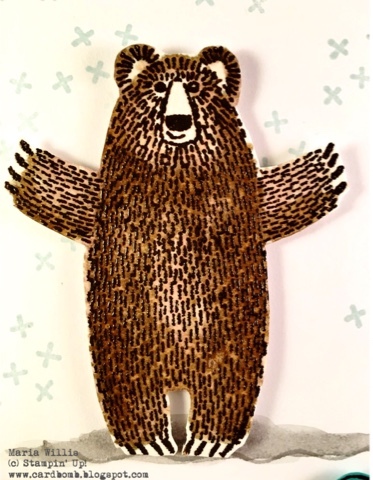 Bear Hugs and Sunburst Sayings! Woohoo! The hour has finally come when the gag order is lifted and we can share some of the info we learned at OnStage with you! I didn't have much time to stamp today...only enough time to quickly make this card. I used two new stamp sets called, Bear Hugs, and Sunburst Sayings! I used the big bear from Bear Hugs in this set...just wait until you see baby bear! Here's a close up of the bear hug! Guess what?! There are framelits that go with this set too! I had to fussy cut the bear and heart but soon I won't have to (as soon as I can order those framelits!)! 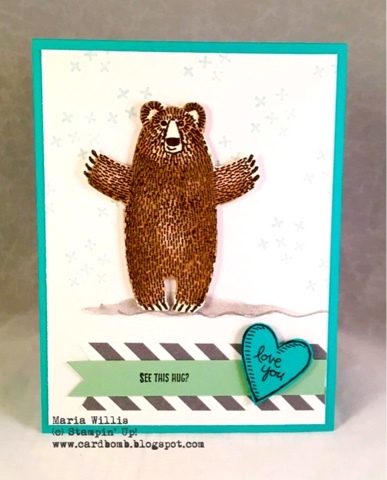 The background stamp (little x's) and the wavy line that I used to ground the bear are both from Sunburst Sayings. I'll be back soon with more sneak peeks. Since I attended OnStage I am lucky to have the opportunity to order very early-like I placed my preorder today! Yippee! Can't wait to share the goods with you all! Let me know what you think of this new set and feel free to ask me any questions!